TEL AVIV, Israel (AP) — Israeli Prime Minister Benjamin Netanyahu vowed on Wednesday to maintain a permanent Israeli military force in the West Bank, saying that if it weren’t for Israeli troops stationed there Palestinian President Mahmoud Abbas would be “overrun in two minutes” by Hamas militants. 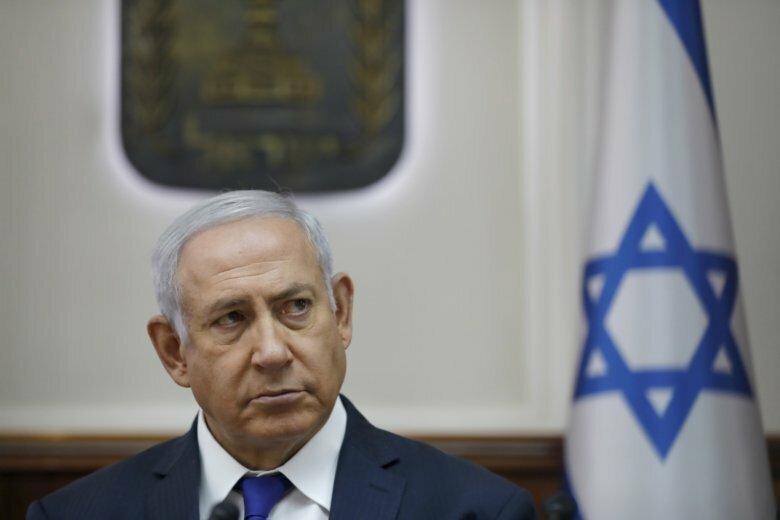 Netanyahu told a major Jewish conference that Israel doesn’t have the liberty to repeat its mistake in Gaza, where Hamas violently seized control from Abbas after Israeli forces withdrew from the coastal strip. Asked about his vision for the West Bank, Netanyahu said he preferred to avoid labels such as “Palestinian state.” But he did make clear his view that Abbas, known by his nickname Abu Mazen, and his Palestinian Authority owe their very existence to Israel’s protection, and directly benefit from the presence of Israeli troops. “They’d be overrun in two minutes. A couple of years ago we uncovered a plot of 100 Hamas men to overthrow Abu Mazen. Overthrow? Kill him. Not kill him politically. Kill him. So, if we weren’t there, they’d not be there, which is exactly what happened when we left Gaza,” Netanyahu told an assembly of the Jewish Federation of North America. Israel withdrew from the Gaza Strip in 2005, evacuating its settlements there and pulling back all its troops. The following year, Hamas won parliamentary elections and a year after that, it violently overthrew forces loyal to Abbas and has since ruled the territory with an iron fist. As part of interim peace deals in the 1990s, the West Bank was carved up into autonomous and semi-autonomous Palestinian areas, known as Areas A and B, and Area C, which is under exclusive Israeli control and home to dozens of Israeli settlements. Previous peace talks have come to a deadlock over how much of the territory would become part of the future Palestinian state. Nabil Abu Rdeneh, an Abbas spokesman, said the only way to achieve peace and stability was through a Palestinian state on the entire West Bank, with east Jerusalem as its capital. After years of rejecting the concept, Netanyahu ultimately agreed to the idea of a demilitarized Palestinian state in 2009. But he has since walked it back some, faced with pressure from his more hard-line coalition partners. Maintaining security control of the West Bank is a longstanding position of Netanyahu. Israel continues security cooperation with Palestinian forces even though there haven’t been serious peace talks since Netanyahu took office in 2009. President Donald Trump, however, has promised to present a far-reaching and much-awaited peace plan of his own at some time. Netanyahu’s comments appeared to indicate how far he’d be willing to go if forced to compromise in the West Bank. While Israel and Hamas have waged three wars in Gaza over the past decade, the West Bank has remained relatively calm. Since 2015, Palestinians have killed over 50 Israelis in stabbings, shootings and car-ramming attacks and Israeli forces have killed over 260 Palestinians in that same period. Israel has described most of the Palestinians killed as attackers, but occasional clashes have also turned deadly. The Palestinian health ministry said Israeli troops shot and killed a 21-year-old Palestinian who threw stones at soldiers during clashes Wednesday in the West Bank. The ministry said five other rioters were wounded by live fire during confrontations with Israeli soldiers in the village of Tamoun. The Israeli military said some 50 Palestinians instigated a riot during a routine Israeli search for illegal weapons, hurling rocks and fireworks at the troops. The troops responded with riot dispersal means and live fire. The military said its searches resulted in confiscating two improvised weapons.